“Vanishing Mangroves & Swimming Monkeys” (Give It to Get It # 7) – Yannix(Thailand)Co.,Ltd. Once upon a time, the mangroves along the canal at Khlong Khon covered a total area of more than 11,200 hectares, (43 and 1/4 square miles). However, due to a variety of issues that have adversely impacted the local ecosystem over the years, the mangrove coverage in the area has been greatly reduced and is soon expected to shrink to a mere 800 hectares (just under 4 square miles) of mangrove forest. 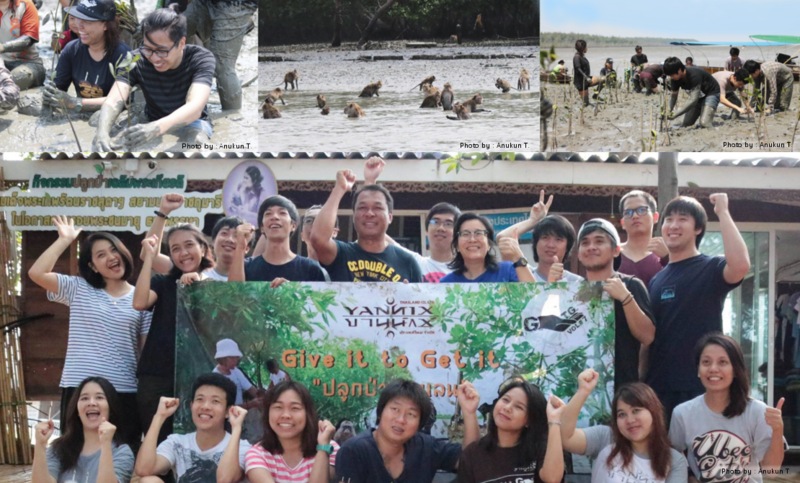 On April 1, Yannix volunteers visited the mangroves to learn and to lend a hand. They were welcomed by Mr. Piniti Ratanapongtara (Project Manager) who provided the volunteers an education in mangrove conservation as it relates to the environment, and the local economy. He offered insight into how to protect the mangroves from wind and waves during monsoon season, and he taught those in attendance how to plant mangroves. One of the more special aspects of the trip to Khlong Khon was getting to see the swimming monkeys up close.